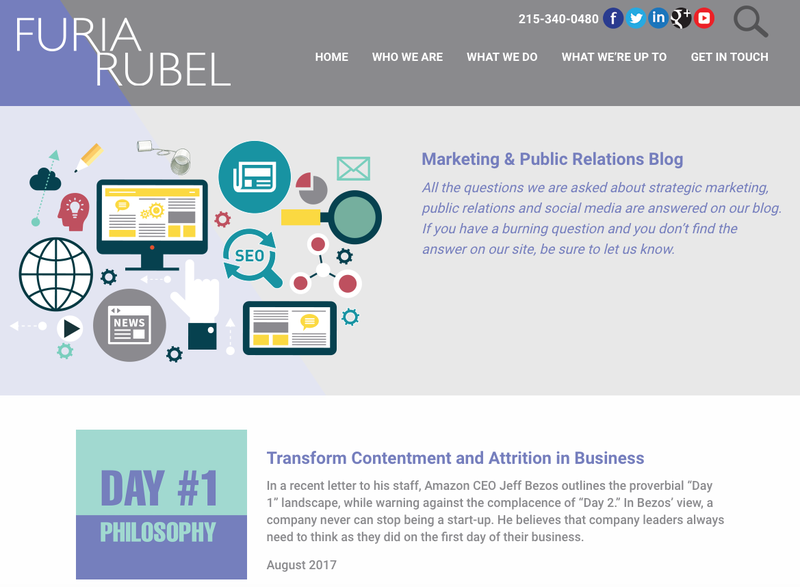 As Furia Rubel Communications celebrates its 15th anniversary, we have launched a new brand and a new website - and that includes a new blog. Click on over to our new blog and follow us there. 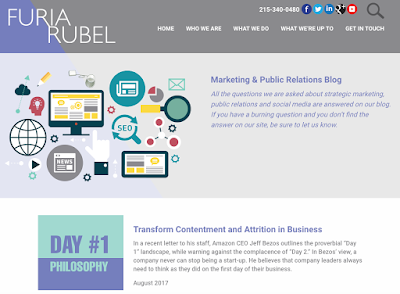 In addition to the law firm public relations strategy that we have always shared, we also provide insight into advertising, marketing, social media, business development, and more. Thanks for following, and we hope to hear from you soon. In Bezos’ view, a company never can stop being a start-up. He believes that company leaders always need to think as they did on the first day of their business. “Day 2 is stasis. Followed by irrelevance. Followed by excruciating, painful decline. Followed by death. And that is why it is always Day 1." His letter is a powerful reminder of the importance of staying focused on your clients and their needs, every day. For instance, marketing of a company is not really about the company’s products or services per se, it is about how those products and services fill the wants and needs of the company’s particular customer. Provide value. Like many of the successful consumer-facing companies such as Amazon and Zappos, it is client value and client service that differentiate thriving companies from their competitors. Focus on the future. Always look ahead for your clients and your business. As markets and industries evolve, so must your products, services and delivery methods. See the big picture. Understand that short-term decisions cannot be allowed to affect long-term success. Sometimes, in fact, difficult decisions, such as reorganizing staff, no longer providing certain services and changing product offerings must occur to ensure the long-term health of your business. Make decisions quickly and learn from others. Embrace the process of “disagree and commit.” Not everyone will agree on every decision, but it's still possible for people who disagree to work toward the same goal. Those goals should be dictated by quantifiable client feedback. Remember, it is client service and client value that you ultimately should strive to be known for. Focus on results and not just process. While process is important, it cannot wag the dog. Use it as a tool, not as the proxy. Daniel B. Kline, for The Motley Fool, asks, “Is it really always Day 1?” Kline says, “What Bezos is doing is guarding against the contentment that success can bring. He's creating a culture where past results do not guarantee future success so it's always important to strive, innovate, and be open to change.” This is the key takeaway. This business advice is much like long-term relationships, whether it be marriages, commitments, friendships and the like. 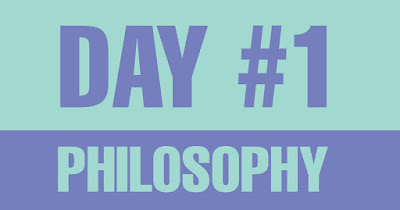 In order to keep a relationship fresh and interesting, to meet the wants and needs of the other party, and to keep the relationship alive, it serves us well to think of every new encounter as a first date. Because, like Kline said, “past results do not guarantee future success,” and this is true in all relationships, business and personal alike. Social Media is essential. The fact remains that millennials are using social media more than any other age group in the U.S. Data released by the Pew Research Center indicates more specifically that Facebook is the choice platform of millennials (88 percent), with Instagram creeping up to second place (60% percent). Keep a blog, and keep it updated. 33 percent of millennials review blogs before they make any type of financial transaction, compared to fewer than 3 percent who use TV news, magazines or books. Millennials are also incredibly self-reliant. Having always had the internet at their disposal, millennials are used to finding the information they need themselves. You can feed into this self-reliance on your blogs by providing well-written answers to common legal dilemmas that are hyperlinked to your legal experts within the firm. This will also direct your target audience to your firm for further legal services and advice. Know your limits. The American Bar Association requires lawyers to stay abreast of the benefits and risks associated with technology in relation to the practice of law. While social media can be a great opportunity to stay engaged with millennials, it's a constantly changing environment where many of the old school regulations are being adapted or applied directly towards technological advancements that are deemed within their purview. The good news is that there are resources out there that can help you stay on top of these changes. Regardless of whether your firm even has a social media account, it's important to regularly participate in continuing study and education and comply with legal education requirements. You have to be one, to know one. Hiring millennials to join your team is one of the more critical investments you can make for the future of the firm and its growing target audience of fellow millennials. According to Nika Kabiri, Director of Strategic Insights at Avvo, one in four Americans are dealing with legal issues, and half of those Americans are millennials. Not only can millennials identify more closely with the younger target audience, but they tend to also be ambitious as well as fluent in social media and digital technology. Be proud of your pro bono work. Social media isn't the only thing that attracts millennials. They are also interested in what companies do in their community. Millennials may be apt to choose your services over others if you have a pro-bono roster that exhibits a more empathetic and charitable firm. A 2015 Elite Daily Millennial Consumer Study revealed that 75 percent of those surveyed thought it was important for a company to give back to society. Big changes from Facebook took effect the week of July 18. In order to combat the ongoing spread of misinformation, Facebook has changed the way users can edit the previews of links that they post to the social media platform. This latest update from Facebook eliminates the ability to customize link metadata, which determines the headline, description, and image shown in the preview of the link. According to an article by Engadget, the preview function has been abused by many fake news outlets, which “have been taking advantage of the ability to customize a story's metadata to spread misinformation.They often replace the headline, image and snippet with something controversial to get the most shares, likes and comments possible." This change allows Facebook to eliminate at least one method of disseminating false information. The social media platform recognizes that legitimate publishers and content creators rely on the customization function to tailor their shares in order to improve audience engagement, and Facebook developers have been working on a solution for them. In the meantime, content creators can continue to customize how links appear with Open Graph meta tags. Open Graph meta tags are an important option to consider to optimize content on social media. Overall, this change signals a serious commitment from Facebook to curb the spread of false information. Shortly after the 2016 election, Facebook founder Mark Zuckerberg announced an initiative to stop fake news. The elimination of the ability to alter link previews appears to be one of many steps the social media giant is undertaking to achieve that goal.